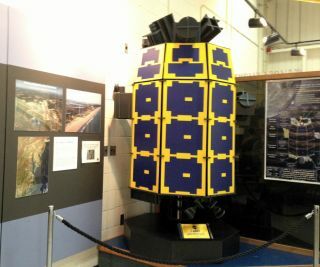 A 1:1 scale model of NASA's Lunar Atmosphere and Dust Environment Explorer spacecraft on display at the space agency's Wallops Flight Facility on Wallops Island, Va. Image released on Sept. 6, 2013. WALLOPS ISLAND, Va. — NASA's next moon-bound probe may look relatively small in person, but it's responsible for potentially answering some big moon mysteries. NASA officials have placed a full-scale model of the Lunar Atmosphere and Dust Environment Explorer (LADEE) spacecraft in the lobby here at NASA's Wallops Flight Facility, to represent the real LADEE (pronounced "laddie" not "lady") that is currently stored away inside its Minotaur V rocket, ready to launch later tonight (Sept. 6). At 7.7-feet by 4.7-feet (2.4 meters by 1.9 meters), the LADEE spacecraft would be dwarfed by comparison to the car-sized 1 ton Mars Curiosity rover. But weather permitting, the rocket carrying LADEE will put on a big show for observers along the East Coast of the United States. LADEE's launch can be seen from sites along the East Coast of the United States.